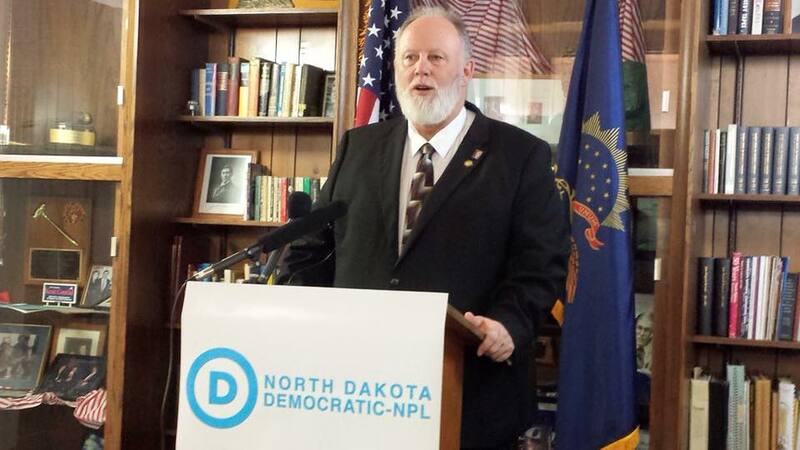 Democrat Marvin Nelson, who will be running against Republican Doug Burgam for North Dakota governor this upcoming November. Photo courtesy of official site. For the North Dakota oil industry, major changes seem to be occurring on a regular basis and now, those changes appear likely to impact politics in general, and the upcoming gubernatorial race of fall 2016 in particular. Many of these changes relate to the price of crude oil itself, particularly when combined with the relatively new method of producing oil known as fracking. For those not familiar with the term, fracking essentially means breaking apart rock formations located deep underground in order to recover vast quantities of oil which had, before the age of fracking, been trapped inside those formations and been virtually inaccessible. One of the most important of all fields which involve the fracking method is the Bakken oilfield located in western North Dakota, with activity centered near the city of Williston. The quantities of recoverable oil have been estimated to be as large as seven-billion barrels, and it is the scope of that opportunity that has driven activity in recent years. According to a recent article from CNBC News, the cost of producing a barrel of crude from shale sources generally ranges from $30 to $70 per barrel, and it is the comparison of those costs with the rapidly changing commodity price for crude oil which has indeed resulted in dramatic economic and social changes for the City of Williston and the State of North Dakota. Clearly, when the price of crude is far above the cost of production, industrial expansion leading to rising prosperity takes place – and vice versa. After some years of relative dormancy, the price of crude headed sharply higher from 2008 through mid-2011, rising from the low $30s to near $115 per barrel, and then remained inside a range of $80 to $110 through mid-2014. Those years coincided with the widespread use of fracking and opened the doors to vast potential profits for oil capital. As a result, rapid expansion of oil exploration and production programs took place, accompanied by gains in employment and associated economic activities – and prime beneficiaries of those activities were Williston, in particular, and the government of North Dakota. Then came the dramatic reversal – and dramatic it truly was as the price of crude collapsed to under $30 per barrel by early 2016 and is trading in the lower $40s as this is written in late summer 2016. As many companies found their costs exceeded their revenues, operations began to shut down and economic activity contracted sharply. Williston’s own history can serve as a barometer of those years. During the high oil price expansion boom, as petroleum drilling and production activities expanded, the city’s population grew from about 14,000 in 2010 to near 24,000 by 2014, and when man camps for oilfield workers were included, it is estimated the area population reached as high as 40,000. This growth fueled soaring construction, retail and government programs, adding fuel to the ‘boom’ psychology. But it didn’t last. When the oil price collapsed, companies shut down their operations, laid-off workers left the area, apartment and trailer park vacancies rose, retail establishments went out of business, real estate “for sale” signs littered the landscape – and, of particular importance, tax revenues plunged for both the City of Williston and the State of North Dakota. The impact of these revenue declines on the state government had a severe impact. After years of strong revenue growth which allowed for a continual expansion of government programs, matters reversed swiftly. In February 2016, Governor Jack Dalrymple issued a public information release, which noted he was ordering “…deep cuts to government agencies and a massive raid on state savings to make up for a more than US$1 billion budget shortfall…” He also acknowledged “…after 15 years of receiving almost entirely good news…things have gone in the other direction”. Much of the shortfall has been made up by raiding funds accumulated during the halcyon years, but that source of funds may be running dry. As the release noted, “…the Governor also will take more than US$497 million from the state’s Budget Stabilization Fund…”. However, the release also noted that, “…that fund will now have a balance of about US$75 million…”, leaving open the question of what will happen if that fund becomes exhausted and petroleum prices remain low. Dalrymple will not have to face that problem, however, as he recently announced his imminent retirement when his present term ends. Primary elections were held in North Dakota this past June with Democrat Marvin Nelson winning his party’s uncontested primary, while businessman Doug Burgum of Fargo won the Republican nomination after a heated contest with N.D. Attorney General Wayne Stenehjem. Political observers note that Burgum is the odds-on favorite to become the next governor in November’s election since North Dakota voters have not elected a single Democrat to important statewide office for almost one-quarter of a century. Whatever the outcome in November, the new governor will be forced to face the distinctly ominous reality that unless the price of petroleum climbs quickly and strongly back above the cost of production, the State of North Dakota could be facing a period of true austerity.